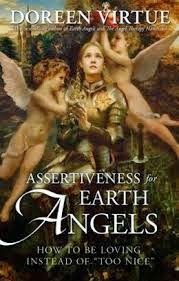 Doreen Virtue’s book, “Assertiveness for Earth Angels” brings to life the reality of Earth Angels in very easy way. It’s an exciting must-read! Manifesting miracles for others such as controlling weather conditions and becoming invisible at will. You have a graceful and compassionate aura that inspires people. Your presence “lifts” everyone to happier spirits – it is proof of who you really are. You don’t judge others but you overdo the “acceptance” bit. So, you tolerate even those who show no respect for boundaries. You cannot stand anyone suffering or being in pain. You are constantly “rescuing people” because it is in your nature to want to see everyone happy in this world. But you also attract many “professional victims” – those who take advantage of this. You are conflict-phobic. You cower before an angry person. You will do everything possible to avoid a conflict or confrontation. This is because you want to experience only love and happiness around you. You worry that you are “bothering” others. So, you tend to say, “Are you mad at me?” or “I am sorry” and “Thank you” more often than anyone else others know. 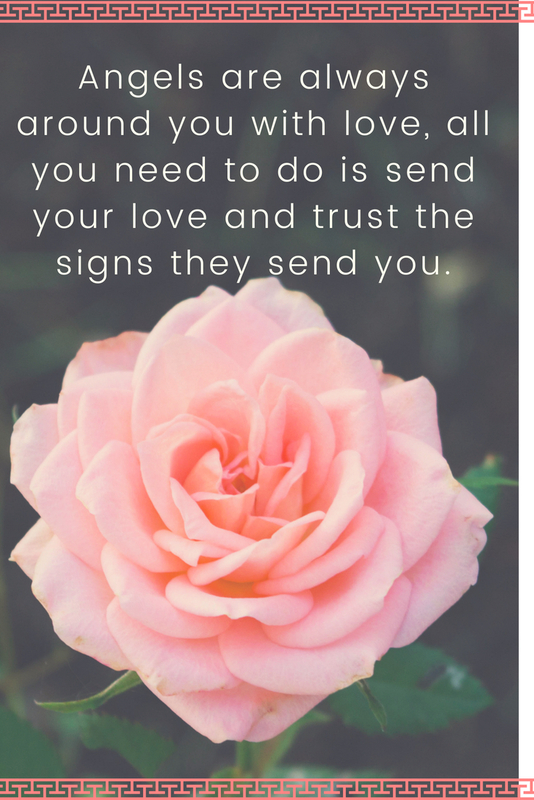 This happens because Earth Angels need to feel their loved ones are ALWAYS connected to them. If not, they feel disturbed. You are not comfortable with your body, particularly your feet. This is because you are not fully grounded as an Earth Angel and so you always have a feeling of “floating” above the earth realm. People close to you often point out, “Where are you gone?” right when you are there because you don’t seem to be actually there with them. You don’t ask anyone for help because you are used to helping and serving others. It confuses you when receiving help (even tiny favors) from others around – because it is not part of your mission on earth. You tend to always feel insecure in relationships. If some one is holding back, an Earth Angel’s first impulse is to go chasing after them, get an assurance that the person is not angry or upset with them. This often backfires in relationships but Earth Angels do not understand why. Be it as a parent or a professional, you are not competitive. Getting ahead of others has never been your focal point. This is because you want to see everyone win and get an equal chance to succeed. Everything you do stems from a place of love and gratitude that reflect in your actions. You have the power to turn invisible while you are physically present. Most Earth Angels manage all their tasks in the physical world in a very silent way that people don’t even notice them unless the Earth Angels “want” them to. 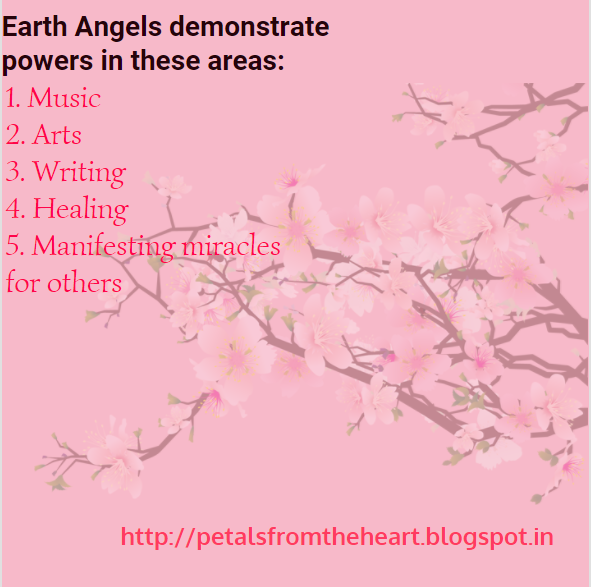 Earth Angels are constantly nursing and serving the needs of others. So, they take on a lot of toxic energy into themselves. Result – many Earth Angels suffer suicidal tendencies, depression and life-threatening illnesses. Breast cancer is most common among Earth Angels because at the astral level, it represents a serious body-soul lack of love and disconnect. Don't miss reading Doreen Virtue’s book, “Assertiveness for Earth Angels.” It takes you to a different world altogether – one that probably exists within you and you never really put the jigsaw pieces together to see the whole big picture. NGDCs .. Made me think about aspects in "Zen Thiruvathira Kali" half way thru .. (Originally made conspicuous of the conceptualization of this Art perhaps by the 1924 Sreenatha Bhootha Natha Vilasom NSS Karayogam women in Palluruthy ..) :O .. Sounds like an interesting book, Swapna! NOt only good advice on recognizing earth angels but some encouragement and inspiration to become earth angels ourselves. We can all serve, help, give and share more each day even if we aren't quite 100% earth angels yet. @JK Hadn't heard of the initiative till you mentioned it. @Vishnu It really is an interesting book and there's a complete series from thereon. I am definitely going to keep reading the series. And I really liked your point about evolving us serving and evolving into Earth Angels. Thanks for sharing your thoughts here, Vishnu. @Shilpa Garg Glad to know you really liked it. It's quite an exciting book to read. NGDCs .. Zen Thiruvathira Kali is perhaps based on a Zen styled concept in Kerala called "Aayilyathinu Ara Thiruvathira" .. something like a "Beauty vs Brain" analogy .. in this the girls or women performing Thiruvathira Kali stands leaving a gap for one in between and they instead of clapping the hands with each other do that in the air gap in between .. so some kind of a clapless clap probably into the air gap in between .. So for performing this art the number people required is minimum .. even with a single person Zen Thiruvathira Kali can be performed .. It is said for the right worshippers / devotees of Zen at threshold point, Zen might strike watching Zen Thiruvathira Kali .. :) ..
O_o .. NGDCs .. Original Intended Link was this ..
@JK - Interesting info there, thanks for sharing. Sounds like my mother, but also like my partner. I have lost connections with my guild, and ever since I started looking into this and tapping into my abilities, I lose more and more connection. But there's this: the demons get clearer, they say their coming to find me. I know its an extreme risk to post this but I'm worried. Im lower ranked, alone, and defenseless, I'm an earth angel so I'm without my blade. Can someone help? It is scary knowing there are evil dark forces out there but from my personal experience once I surrendered it all and ask my higher power to please guide me in finding my spiritual purpose and I can't even begin to tell you all the miracles happening in my life right now. You are never defenseless. You just have to lay all your fears aside and really just have faith and trust with all your heart that we will never be given more than we can handle and all that is asked and wanted of this earth is for everything to live in abundant happiness, peace, and share our unconditional love. It could possible be our egos that is showing these signs of darkness according to my research. It's rare to find a truly spiritual being that hasn't been through a great deal of suffering. It's refreshing to see so many likes on these videos about earth Angels. I like I saw 450 something likes compared to 57 dislikes. Nothing absolutely NOTHING happens in God's world by mistake. Since I have Accepted my destiny everything has became so clear. Ideas just keep floating in, I got a new car all by myself for the first time, (I'll be 30 in May), I don't need for anything, got the job I absolutely love back, and the list keeps on going. We are creatures of mother nature and the only reason we had to endure any type of suffering is to show us compassion and give us an understanding of the human mind and how and why it works in different real life situations. It's actual a brilliant idea is you ask me. FEAR has two meanings and I've experienced both first hand. Fear everything and run or Face everything and rise. For those of you who believe you are Earth Angels, do keep in mind that the book gives more information than my review. Do read the book first. @Shaleigh - If this interests you, do read this book. @Kari - Good to hear from your experience. @Siriusually - According to Doreen Virtue, this means that they are physically present but able to blend into the crowd or background in such a way that their presence is usually not even noticed unless they try to catch attention. How do I meet others? How do I know?